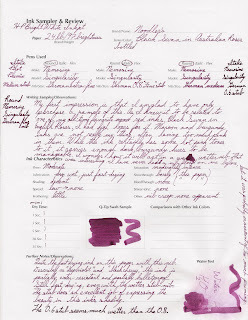 When I first tried this ink, in the Nemosine Singularity with an extra-fine nib, I was not much of a fan. However, it has grown on me. Using it in a wetter nib, like the 0.8 stub, the colors deepen and take on more variation and shading. I will still prefer the Noodler's Black Swan in English Roses, but, for those who like a more burgundy/pink ink, this works nicely.